Some of the smaller record labels are all too easily overlooked, and it would be interesting to know in how many of our readers' collections Lorelt is represented? Odaline de Martinez's company's emphasis is on 20th Century & Living Composers, and specialist interests covered include Latin American Music and Music by Women Composers. If readers feel that Women Composers should no longer need a category to themselves, it is pertinent to remember that they have had a hard time with the "Establishment" until very recently, and are still under-represented in concert programmes. Also, to know that elderly music lovers like myself go back to a time when the great orchestras admitted few, if any, women players; Beecham even had a male harpist ! Following two recent Brazil Plus concerts by Lontano, we have been pleased to receive for consideration a representative batch of recordings on Ms Martinez's Lorelt label, the latest of them Elizabeth Maconchy's Music for Voices [LTN 127]. 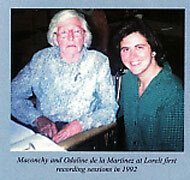 Maconchy [pictured above 1992, with Martinez] was involved with the launch of Lorelt was active right to the end of her long life (1907-1994), which is celebrated with the new BBC Singers recording of a wide selection of her impressive body of choral music. Full notes by her daughter Nicola are included, but necessarily in small print to cram in all the words of the splendid texts; they are an essential accompaniment for listening because of the overlapping textures which make following of the poems without the eyes to help impossible. In these days of purchase by download, Lorelt should seriously explore making the words available on line (copyright considerations permitting). Some rivals (e.g. Naxos) do so routinely; none of the properly enthusiastic reviewers makes this point. The dauntingly prolific Villa-Lobos was the lynchpin of those Brazil Plus concerts, and the Lontano/BBC Singers CD of a selection of his Chamber and Choral music [LNT 102] includes several items from those concerts; it is a delight from beginning to end. Thereare exotic instrumental combinations in the ensemble pieces and a curiosity is the original version with voices of his ninth Bachianas Brasileiras, better known in its strings arrangement. Delicious. Leading Brazilian pianist Clelia Iruzin took part in both those Purcell Room concerts; of her recordings on Lorelt, I like particularly the Mignone disc [LNT 124]. She was introduced to him when a seven-years-old pianist and this major composer [1897-1986] remained close to her for the rest of his long life and this is an enchanting selection of his piano music, with a vitality echoed in the charming cover picture. There are two CDs of music by New Zealand born women composers which have given us great pleasure [LNT 116 & 126]. The first has works from four composers; Gillian Whitehead's name - recommended for exploration by Maconchy's daughter Nicola Lefanu - initiated my quest in this esoteric area, q.v. her Composer Portrait disc [NZ Music Vol.III WTA003]. They have all studied abroad, UK much favoured, and have variously emigrated &/or returned to their home countries (Whitehead has homes in both NZ & Australia, and her music has Maori references, e.g. her piece here Ahotu). The ensemble music on LNT 116 is nicely varied. Jenny McLeod's For Seven is a rigorously organised piece composed in Cologne for Stockhausen's ensemble, which she is pleased to find people nowadays think to be free and spontaneous... Annea Lockwood's Monkey Trips composed for California, are improvised by Lontano's soloists, who really let their hair down, ending with a chorus of laughter as the Monkey "begins to see that the walls - - are self-created. And breaks through into open space"; a nice metaphor for record collectors who are stuck in the "canon" as disproportionately promoted by the leading magazine and newspaper reviewers... Dorothy Ker, who left New Zealand in the early '90s, and is now a Research Fellow at Sheffield University, draws her stimulus from extra-musical sources and most of her pieces here were composed with Lontano's clarinettist Andrew Sparling in mind. She fully merits Lorelt's composer portrait disc, given by Lontano's twelve players representing some of Britain's finest instrumentalists. If this brief survey whets your exploratory appetite, do Google Musical Pointers for some of our other discoveries which are likely to have escaped the broadsheets, e.g. our extensive coverage of Swedish contemporary music, mostly from STIM, and those from the remarkable Chicago label, Cedille, a non-profit making foundation dedicated to documenting the work of the city's finest musicians, ensembles, and composers. Details of all Lorelt releases can be accessed at http://www.lorelt.co.uk/. Andrew Sparling is often to be seen as a stalwart clarinettist performing in London. Here he indulges himself with commissions, some for his microtonal Howarth clarinet (q.v. Chis Redgate's 21st C Howarth oboe).